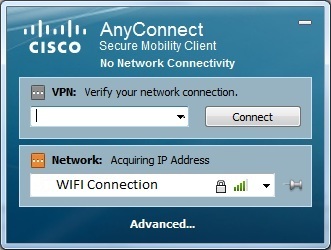 I use Cisco AnyConnect on my Windows 7 computer to make VPN connections. It also has capability to connect to WiFi. But I always had problems in connecting toWiFi with AnyConnect. Connection drops frequently and it keeps saying ‘Acquiring IP address‘. AnyConnect installs a service called ‘Network Access Manager‘ which seems like takes over the native Windows WiFi connecting client. So when I click on the network icon in the System tray it says ‘No connections are available'(See below snapshot). Without AnyConnect, it always displays the WiFi connections available. If you are facing the problem then you can try the following solution that worked for me. Find the service ‘Cisco AnyConnect Network Access Manager‘. Right click and stop the service. When you reboot your system, the NAM service will start and may cause problem again. You can disable this service in Services management console to prevent that. AnyConnect has settings to disable the NAM feature. But that did not work for me. Even after disabling NAM service, I could not connect to WiFi. 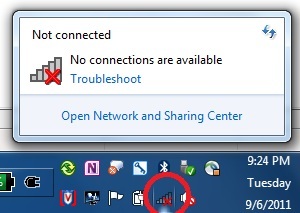 Windows network icon shows the WiFi connection but gives the error ‘Windows was not able to connect to…‘. I followed the below steps to do this. Opened Anyconnect window and click on Advanced. Clicked on ‘Networks’ tab in the left side pane. Clicked on Configuration tab. Changed the NAM to disabled as shown below. Thanks Dude! You saved my day. I wonder how cisco released anyconnect with such an obvious bug. Even i have the same problem.Thanks for sharing the info but it didnt help me completely. If i disable the NAM then VPN authentication is failing/ If i enable the NAM it disables my WIFI. Can any one suggest me some good idea how to overcome this problem? By ‘disabling NAM’ you mean you stopped the NAM service, right? Disabling NAM in any connect UI did not solve the issue in my case. I stopped the NAM service in services.msc. The issue could be with the local firewall installed on the machine. Also, if you have more than 1 firewalls or 1 firewall and a HIPS installed on the machine could result in similar issues. More than 1 firewall on the machine always conflict, remember you already have windows firewall turned ON. You can also generate DART Bundle and analyse NAM logs and check where is it failing. I’ve spent so much time trying to change settings, release/renew/flushdns, disabling AnyConnect’s network controls, and rebooting, rebooting, rebooting. This seems to have finally allowed me to connect to new WiFi networks without issue. Thanks again. Cisco needs to fix this, what a horrible bug. Brand new Dell 5510 Brand new Laptop – Support unable to solve the cicso anyconnect issues. I completely disabled anything with cisco – Just frustrating. How can Cicso program take over the WIFI network, I have other VPN and Wifi connections. Please help with replacement drivers. Thanks, this fixed my problem! Thanks .. was struggling for this.. disabling the NAM ,is working.. Thank you for the help. It worked.